There was a big digital radio boost today in the Dorset area just in time for listeners to hear the Cherries kick off their Premier League debut. New digital radio transmitters were switched on in the area bringing local digital radio to over 100,000 listeners for the first time and boosting the digital signal for many others. The enhanced coverage means that listeners currently served in the Bournemouth and Poole area will receive a boost to their signal, and are now joined by Dorchester and Weymouth in being able to receive their favourite local stations - BBC Radio Solent, Wave 105, Heart, Capital, Smooth, XFM and Fire Radio - on DAB digital radio. 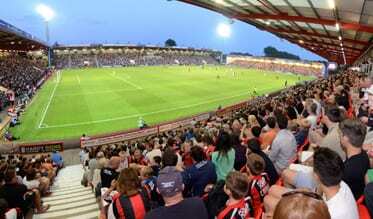 Sports fans across the county will be able to follow the progress of AFC Bournemouth on BBC Radio Solent including the station’s live and exclusive commentary of AFC Bournemouth’s opening match at the Vitality Stadium against Aston Villa on Saturday 8 August from 2pm. The big Dorset switch-on saw communications infrastructure company, Arqiva, turning on two new transmitters at Poole and Bincombe Hill, as well as boosting the transmitters at St Catherine’s Hill and Winterbourne Stickland. This will increase DAB digital radio coverage for local stations to over 80% of the population in the area - around 300,000 households - and will add many miles of roads into local DAB coverage for the first time. Arqiva will be switching on a further digital transmitter in Shaftsbury covering the northern part of the area before the year end. Ford Ennals, CEO Digital Radio UK, said: "This is a big weekend for radio and for Bournemouth and the surrounding area. From today over 100,000 listeners will be able to receive their favourite local stations and follow their favourite local team on DAB for the first time." Almost 54% of homes in the Bournemouth area have a DAB digital radio, and 41% of radio listening hours are to digital platforms. Until now many listeners in Dorset have not been able to receive any of their great local stations via DAB digital radio. The new transmitters are part of an industry and Government programme of work that aims to expand the coverage and listening to DAB digital radio. National BBC DAB coverage has been increased to 96% of the population and the Government, BBC and commercial radio has agreed plans to build a further 182 local DAB transmitters to extend local DAB coverage to more than 90% of the population. This will make DAB available to an additional eight million listeners across the UK and add over 6,700 km of roads into coverage. Over 21 million DAB digital radio sets have been sold to date in the UK. Digital radio is very popular in cars and 70% of new cars now come fitted with digital radio as standard (CAP/SMMT July 2015).